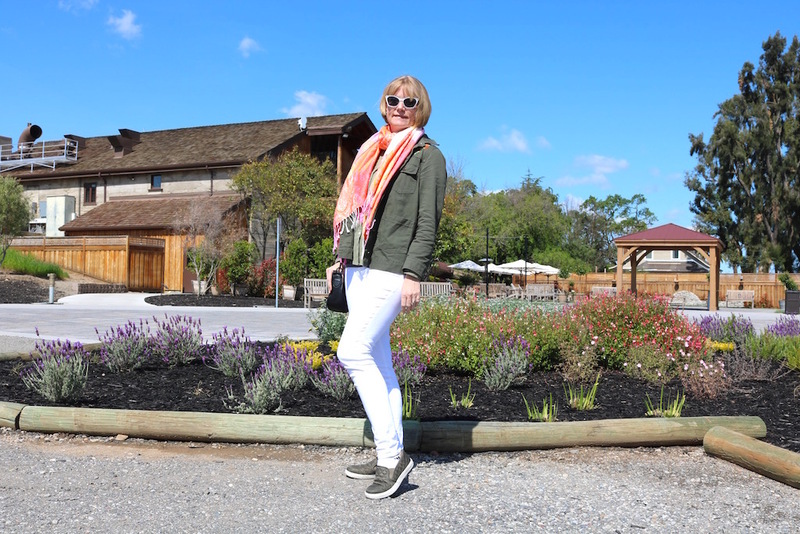 A few weeks ago, Andy and I got to spend some quality time together and decided to go on a spontaneous date to Livermore Wine Country. 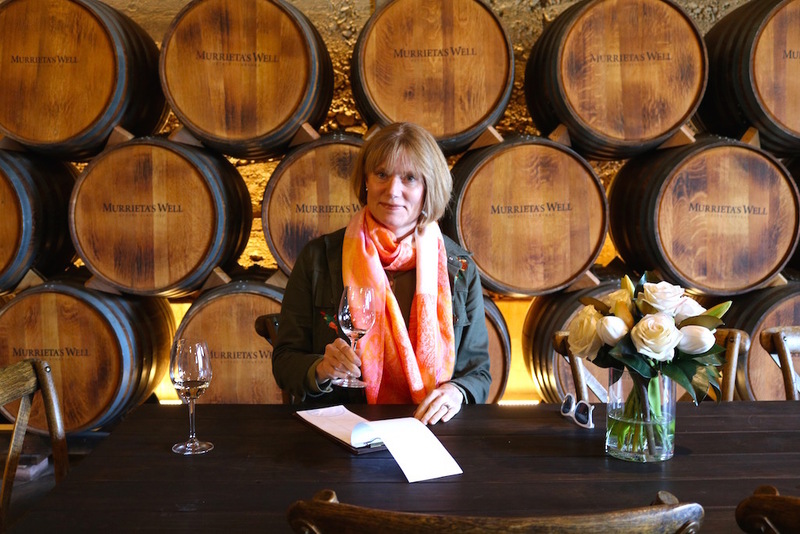 We ended up in one of our favorite wineries, Murrieta’s Well. I decided to keep my outfit casual and wore white jeans, an olive blouse and an olive jacket with some embroidery. I also wore olive slip ons. I really like white and olive together. I bought the jacket and the slip ons for my trip to Germany at the beginning of April, and they worked out well. Outfit details: White jeans, olive jacket with embroidery, olive slip ons. The winery’s tasting room is beautiful, and we also got to enjoy a charcuterie board. Questions: Do you live olive green paired with white? What’s your favorite color combo at the moment? What a nice winery! I like olive paired with white. The scarf is pretty, too! What a fun outing Andrea!! And you're going to laugh, but I just wore my white jeans with olive yesterday (my olive green utility vest and OTK boots)!! This post makes me want to go wine tasting. I've always wanted to explore Livermore. It's such a great area to explore! I love it! The lightness of the peachy colors in the scarf compliments the olive and white so well! Lovely winery too! Thanks, Andrea! Have a wonderful week! Looks so nice, Andrea! I am wearing olive green on my blog today too...it is truly one of my favorite colors! Love how you styled it. You look fabulous in olive, Pam! I love OLIVE anyway and anywhere. It is probably my favorite color. Have been debating about buying some olive sandals. Seeing your great olive slip-ons has inspired me! The photos from the winery are beautiful. Hurray for spontaneous dates. You should definitely get some olive sandals, Leslie! They'll go with so much in your closet! Olive and white are a great combination! I love the sneakers you wore too! Thanks, Lauren! The sneakers were a spontaneous purchase for my trip, and I'm so glad I got them! Olive green and white, very nice! I guess m favourite combo at the moment is blue and white.Which is surprising as I haven't worn much blue for years. 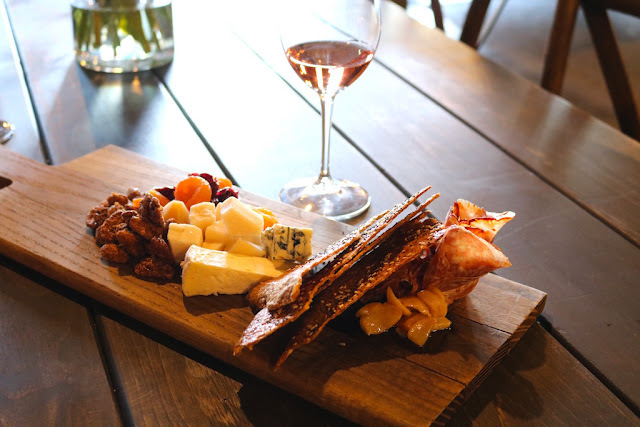 I love the look of the winery and charcuterie board. Blue and white is one of my favorite combos! I love it for summer! Your white and olive outfit looks great! I love the scarf you added. Thanks, Julie! I bought the scarf on a trip, and it is therefore extra special to me. I don't think I've ever worn white and olive together Andrea. White really needs good hot sun to look right and so I'm not convinced it's great here in the UK. I love your casual styling here though and can honestly say that white paired with olive doesn't look in the least out of place with you. What a lovely way to spend the day - that spread looked delicious! Thanks, Anna! I think you have a point that white looks best when it's sunny. I agree - great color combination! Looks like a great day for your date, and you looked beautiful! I'm currently looking for some white boot-cut jeans. Not having a lot of luck! My colour that I'm collecting is Navy, but I'm also loving the baby Blue's and pinks this year. It's tricky to find the right white pants... Navy, baby blues, and pinks - all great colors! I love olive with wine!.....Oh that's not what you meant! Hahaha, just kidding, couldn't resist. I love olive and it combines with so many colors, but I have never worn white pants. I think I might try! Haha. You are too funny, Nancy! I love the way white brightens up olive green! What a fun day date! It looks like a beautiful winery and such a lovely day! 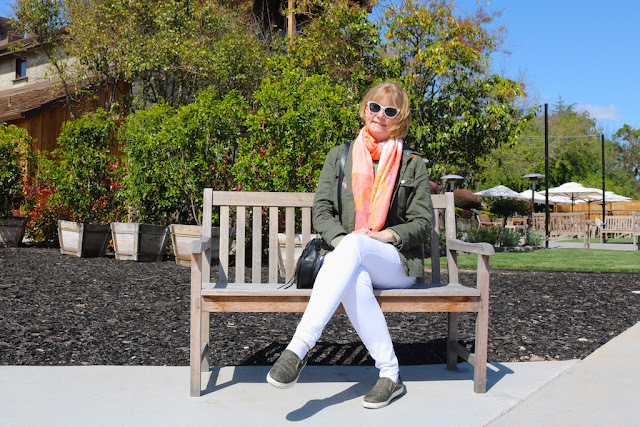 Thanks for linking up to our Ageless Style Linkup party. Olive, orange plus white is a great color combination. Thanks for linking up to Top of the World Style. This is a nice color combination to remember. What a fun outing! Olive and white is such a pretty combo! I'm also loving olive and blush pink at the moment! Yes, olive and plush pink is a great combo, too! I enjoy trying so many different color combinations, so I am not sure one sticks out more than another at the moment. For growth you need improvement. But to figure out the particular area where actually improvement required and recommendation, author actually provides all this in just one article. Skeletal Custom Embroidery .